Ricky Martin, Elena Roger Bowing Out of "Evita"
Still want to be “Livin’ Evita Loca,” as the backstage joke goes? Time is running out. Producers Hal Luftig and Scott Sanders said Monday that the top-billed cast of “Evita” will play its final performance on Saturday, Jan. 26. 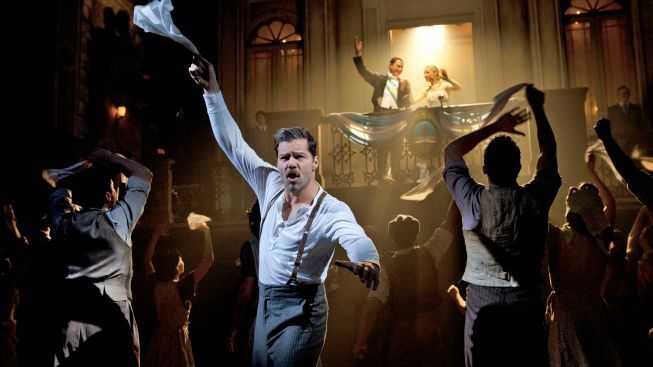 That’s your last opportunity to see Ricky Martin as Che, Olivier Award-winning Argentinean actress Elena Roger as Eva Perón and Tony Award-winner Michael Cerveris as Juan Perón. The production of Tim Rice’s and Andrew Lloyd Webber’s musical will continue its open-ended run at the Marquis Theatre following the original stars’ departure, producers said. New stars will be announced soon. In July, Cerveris talked to NBC 4 New York about traveling to Argentina as part of his research for his role.